I signed up for a great new service recently. The content they share is very broad, so when I receive their emails, it never feels like they are speaking just to me. I know I’m not alone. We live in a world where we’re getting more emails, notifications and interruptions. Our social feeds are overflowing with new content and ideas. I love that ideas can travel the world and we can choose to buy from anywhere. But it makes our digital environment noisier than it has ever been. It got me thinking about the challenges in making sure our messages are relevant, and how we scale that feeling of the personal touch. So I was really delighted to meet Rachel Davis, co-founder and Chief Marketing Officer (CMO) at mobile marketing automation platform Hurree. Rachel and her team serve companies all across the world, with partners in locations as diverse as Denmark and Poland. 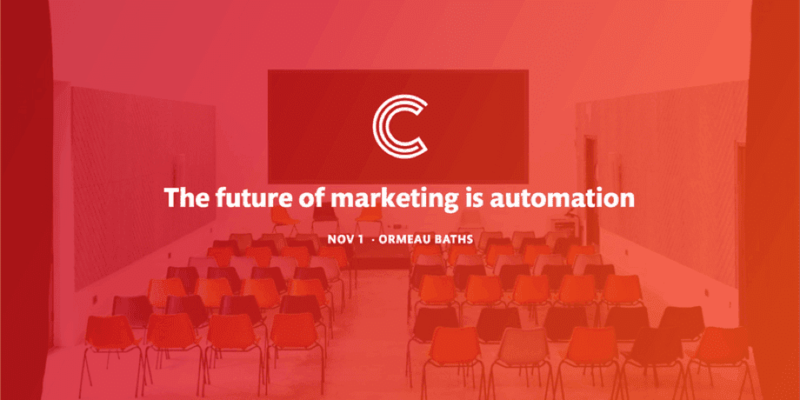 Ahead of our upcoming event, the Future of Marketing is Automation, I spoke with Rachel about the challenges marketers face and how the key to relevant, personalized messaging is to do great segmentation. (I’ve lightly edited the interview for readability). Paul: Could you tell us about the moment a marketer might find themselves in and think: I should really sign up for Hurree. Rachel: We’re about everything that happens after your app is live - retaining those users that you already have. Keeping up lifetime value is better for the marketer. It shows that Hurree’s did its job. 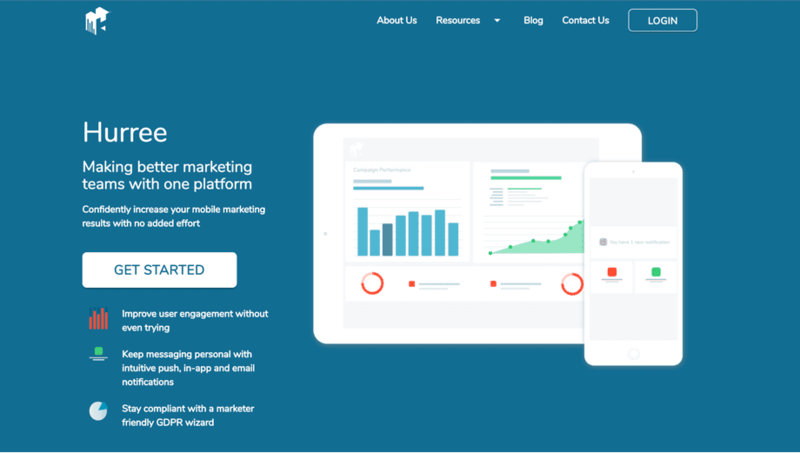 There are other mobile marketing platforms but what sets Hurree apart is our segmentation piece. Any marketer will know that the biggest thing and the best practice is that you set up your user personas right? Most marketing teams start by defining buyer personas. You sit down with your team and say “we’ve got Developer Dave”, or “Marketer Margaret”, something like that. You define exactly who these people are and what their story is, what their needs and what their challenges are. Often that’s done in some sort of PowerPoint. You tell yourself that you’re going to look at those personas for every single communication you put out. And we all know that doesn’t happen. Often, you put the Powerpoint in a drawer somewhere and never look at it again. So Hurree does the segmentation for you. Through our platform you can send push notifications, in-app messages and e-mail. Let’s imagine a brand like Asos for an example. You’re a 21-year-old girl, you have your normal buying habits. Things like shoes, jumpers, whatever that was when you were single, right? You get a boyfriend and start buying presents for him, so you start buying boys jackets, hoodies, as presents or on certain times a year maybe like birthdays, Valentine’s day, Christmas. Our system picks up that there’s a change in your buying habits. So you may have gone from segment A, single girl only buying stuff for herself, into segment B, single girl buying for herself and for her boyfriend. Next, you’re having a baby. So you start buying maternity clothes. Then you become part of segment C: girl with boyfriend that is now pregnant. Paul: I love what you’re saying: we’re all changing and consuming more rapidly than someone can keep on top of with a static segmentation model. If I’m a marketer, I want to make sure my messages and my communication resonates. That its relevant to people. That it’s appropriate to the person, their lifestyle, to their life. And not just when I set my segmentation up, but as their life changes. When people’s lives move quicker, that is really hard to do that manually and you need to be constantly looking at the data that is forming about who that person is, what they are interacting with, how they are buying from you, and use all those signals. You’re saying: if we don’t stay on top of those changes and stay relevant, that your marketing becomes less effective. Maybe that customer relationship breaks down? Rachel: Yeah. That’s what we are about. What should happen with an automated approach is that the customer moves dynamically through the system, without the marketer intervening. Rachel: By automating that process, it actually saves you, the marketer, so much time. You’re confident that you’re always sending the right message to the right user at the right time. Where we dynamically segment the audience, your communication can be more relevant. That 21-year-old girl will only get messages that make a difference in her life right now, even though her buying habits have changed since her first purchase. Which means she is going to trust the company even more. So, saving the marketer time and increasing relevance is very much our ethos for the platform. I think engagement is the key. If you keep it personal, you keep it tailored but deliver on a mass scale, and actually do something that saves the marketer time overall, I mean that’s a winner for everyone really. Paul: You talked about saving marketing teams time by doing things automatically, Don’t marketers have lots of free time? Rachel: Good joke! No! Having come from a marketing background they don’t have time. You have so many things you need to keep on top of. Rachel: At Hurree, we did a global survey last year with over 115 participants. For the average marketer, whether in an enterprise company or a smaller business, they used over seven different platforms. In each of these platforms, they have analytics. If all that information is in different places, you don’t get a full understanding of what that one user has gone through. 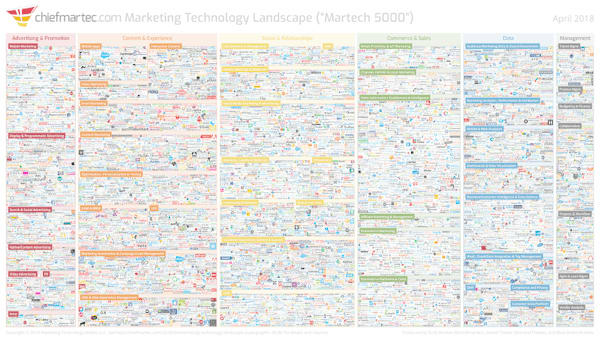 Paul: You’ve seen marketing landscape infographics that analyze the sales and marketing software stack, like Scott Brinker’s Martech 5000. I think the last count is actually nearly 7,000 individual products and platforms that sales and marketing teams are using. Marketers are building a stack by combining different products, because there’s no one platform that solves all of their needs. This leads to the fragmented landscape you talk about. For a marketing team, it also creates friction. You might have all the best solutions, which is terrific. But it means that they need to work to serve customers. You don’t have time to spend administering the tools, keeping things moving. You need those systems to work intelligently by themselves. Rachel: It comes back to your point about automation. Automation isn’t something to be feared. Automation actually just means that you’re going to have a higher level of skilled workers with a higher level of understanding and focus. 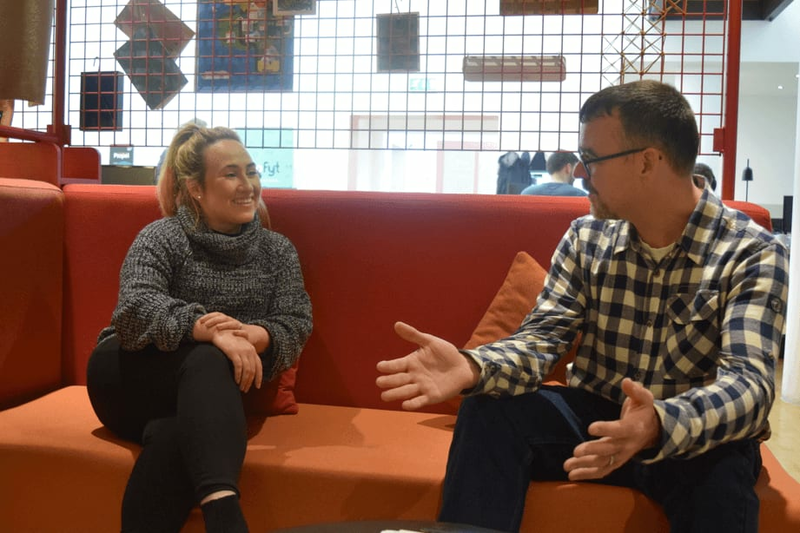 Paul: And it allows you to shift away from thinking of marketing as the execution of tactics towards marketing as a series of activities that deliver outcomes. It allows you to change maybe just the level of thinking that your team is bringing. Paul: There’s obviously a lot of interest in Hurree and in the idea that marketers should be being delivering more intelligent marketing. What do you think are the challenges that hold businesses back today from being more relevant, from doing segmentation, or from exploring automation more generally. Rachel: Budget. Whether you are a massive enterprise or a small business, there’s always going to be skepticism from those that maybe are in charge of the purse strings as to why you’d actually need that resource. Is that going to help the overall business? You have to give a really good business case. Paul: So making the case for budget is always a top priority. Rachel: 100%. That’s why we help our customers to showcase the return for their business from being more relevant. Paul: What’s one thing that you learned along the way with Hurree that you wish you had known back in 2015? Rachel: Your business always evolves. The tight family unit that you begin with, you’re all like going to save the world. Not everyone that you bring to your company is going to be like that, but they still believe in what we’re trying to do, and that’s the main thing. Paul: So your team really believing in what you’re doing is so important? Rachel: Yeah. It’s so important. And that’s one thing we spend a lot of time in the early stage of onboarding any new hire. We have a 30 / 60 / 90-day plan where in that 3-month period being we are really trying and bring them right into the Hurree way of thinking. Paul: So you’re deliberately building Hurree’s culture. Thinking about how you can get the team on board, how do you get them to be productive and also to understand your team’s values? Paul: So what does the future hold for Hurree? Rachel: We were in the Techstars accelerator in London last year, which was great for opening the market. We already had traction, but that opened up a lot of different networks not just within London but also globally. We’ve now part of a New York accelerator, Quake Capital, which has been brilliant for broadening our network over there. It opened a lot of doors for not only sales but investment and things like that. We’re going to be recruiting probably towards the end of this year, starting next year. For us, it’s not only about talent, but whether they fit in our team. We find even if someone is really talented it doesn’t mean that they’re going to be right for the Hurree business. Rachel: Culture is massive for us, we’ve tried to nurture it from when there were four of us on the team. Even though the team is growing, we still have a cohesive team spirit. Paul: Rachel, thank you so much for taking the time to talk. I’m so excited for you and for Hurree and what the future holds. I can’t wait until our panel discussion next week. Rachel: Yeah. That will be great! If you’re interested in hearing more from Rachel, she’ll be joining us at our event on the future of marketing on November 1st. Tickets are free but spaces are limited. Register now.